General practitioners (GPs) and other members of the Primary Health Care Team (PHCT) play a crucial role in the provision of health care for children. At least 25% of GP consultations are with children, and many of the problems encountered are specific to this population group. However, children do not represent a homogeneous population and several ages of childhood are recognised, each with its unique set of illnesses and problems: the neonate, infant, pre-schoolchild, school age child and the adolescent. Furthermore, both the childhood population and their illnesses change with time; new illnesses such as HIV have appeared and others, not seen for many years (such as rickets, tuberculosis and congenital rubella syndrome) have returned. Thus a comprehensiveknowledge of the varied aspects of child health is needed; recognition of the acutely ill child, developmental surveillance, immunisation, treatment of chronic illness, and psycho-social issues. GPs are also increasingly involved in influencing configuration and the commissioning of services at a local level. This textbook provides practical guidance for GPs, GP registrars, practice nurses and health visitors dealing with child health in the 21st century. It undertakes a focused, problem-orientated approach based on the more common childhood problems encountered by GPs. 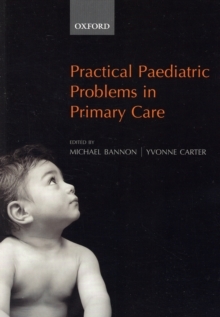 Each chapter includes the essential background theory, but the emphasis is on making the clinical approach relevant and sensitive to primary care. Solutions to clinical scenarios are provided, based upon current, best availableevidence. Site and system specific chapters are combined with sections looking at wider issues such as ethics and law, multicultural issues, and immunisation.